Although I could swear I had never heard of The National Championship before today, I’m sure, at some time, I have unwittingly watched a game, and served the appropriate, tasty, fun, Football watching, finger foods. Boil Marsala, currant jelly and balsamic vinegar in a heavy medium saucepan, until reduced to 1 1/3 cups, about 15 minutes. Cool glaze for 15 minutes. Spray a grill rack with nonstick spray, prepare barbecue (medium-high heat). Place 1 prosciutto strip (1/2 slice) on work surface. Dip 1 shrimp into glaze, place almost at the end of one strip. Sprinkle with thyme. Wrap prosciutto around shrimp, enclosing completely. Dip into glaze, place on platter. Repeat with remaining prosciutto, shrimp and thyme and glaze as needed. Grill shrimp 2 minutes (I cooked mine in the oven under the broiler), brush with glaze. Turn shrimp over, brush with glaze. 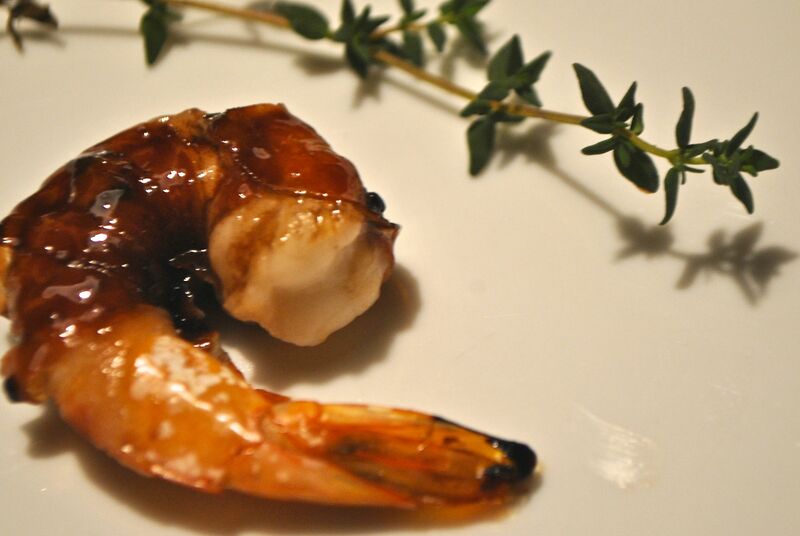 Grill until shrimp are opaque in the center and prosciutto is crispy, about 2 minutes longer.